In light of our upcoming ‘Blockchain2Energy Asia’ conference, we will be interviewing several of our expert speakers in order to learn more about their ideas and get an idea of what to expect during the conference. Today, it is my pleasure to interview Vinod Tiwari, Head of Business Development & Sales for Power Ledger. Power Ledger is one of the leading energy-blockchain companies based in Australia and with developments all around the world. Power Ledger’s vision is to democratize the access to renewable energy via its blockchain-enabled peer-to-peer energy trading platform. Vinod has over 25 years of experience in the field of renewable energy and engineering with major positions in sales, business development and operations. Recently, Vinod was General Manager Sales at Perth Energy with a responsibility for all gas and electricity portfolios. In that role, Vinod successfully grew the energy sales for the company from a $20 million annual turnover to more than $300 million. With Power Ledger, Vinod is heading the business development unit with exciting projects such as the one with BCPG in Bangkok. Hello Vinod! Good to have you here and excited to learn more about Power Ledger. Can you tell us a little bit about your role at your company as well as your experience with blockchain and energy? Prior to my role as Head of Business Development and Sales at Power Ledger, I’d spent over 20 years in the energy industry across multiple markets, including Australia and India, driving business opportunities, commercial sales and strategy. I’ve applied this combined experience connecting with our client stakeholders and strategic partners to support the growth and delivery of Power Ledger’s platform. My role at Power Ledger is very diverse. We’re in the process of moving from a startup to a scale-up and I’ve had the benefit of being there from the very beginning. This means I’m very involved in our growth moving forward, in terms of new clients, partners and hires. On an average day I could be doing anything from presenting Power Ledger to prospective clients, being on a conference call with our channel partners in the USA or flying to various countries to present our solution at energy-centric events. Business development is all about following up on leads and developing ongoing business relationships that are mutually beneficial. What do you see as the main driver of adoption of blockchain technology in the energy sector? There are a few key drivers at play. We are starting to see rising electricity costs, blackouts or no access to power and the potentially devastating toll on the planet the burning of coal, oil and gas can have on the Earth’s atmosphere. Disruption to the energy industry began happening even before Power Ledger came onto the scene due to the development of new technologies and the reduction in the cost of solar, energy storage and electric vehicles. These technologies are disrupting the standard way of doing business in the current electricity markets that have been designed for centralized, large capacity generation. Blockchain can help with the transition from the existing system to these distributed systems involving renewable technologies in a more managed way. Applications of blockchain in the energy sector range from peer-to-peer trading in front of and behind the meter, to electric vehicle charging, demand response and carbon credit tracking as a few examples. In all of these cases, the disruption has come first and blockchain is simply a tool we’re using to best manage an increasingly decentralized grid. Essentially blockchain is helping to better facilitate the disruption of the traditional energy system and bring distributed energy resources (DERs) into mainstream network planning. Definitely. It is not that blockchain is per se causing all this disruption, but rather, it is amplifying it with its decentralized nature. This fits perfectly with a decentralized energy system. In Asia, many markets are being liberalized, which is bound to offer new opportunities for producers, consumers, operators and such. Where does blockchain fit in this puzzle? Blockchain accelerates the uptake of DERs by providing a market-based platform for peer-to-peer energy trading and supporting an entirely transactive grid comprising benefits such as: aggregated capacity, network control services, frequency control and load following ancillary services. Blockchain can help address these increasingly complex interactions and decentralized transactions between network participants whether they are consumers, producers, retailers or network operators. The use of blockchain means that the market can be real-time, transparent, scalable and above all, frictionless -- creating trust between all involved parties. The distributed nature means energy is locally generated and consumed, which results in lower transmission charges and cheaper energy. Power Ledger and BCPG’s peer-to-peer energy trading project in Bangkok. Indeed, we are on the brink of a huge transformation. If we were to have a time machine and travel 15 years into the future, how does the energy grid look like? A future-proof, climate-ready energy matrix that can not only withstand man-made, natural and emerging shocks, such as cyber-attacks, but can deliver reliable, cost-effective energy is already a reality. So in 15 years, I’d envision it to be more widespread. Distributed energy resources (DERs), which provide a wide range of benefits from network control services to capacity management, are the next step in the evolution of the energy system. The growth of DERs will continue and we will well and truly have a decentralized grid in existence. Same goes for increased microgrid environments. It’ll be reliable, affordable, clean and available to everyone. Today, many remote villages are without access to a reliable electricity supply. Transmission of power to these villages is expensive and unreliable. Solar technology and energy storage is getting cheaper and I think within 15 years or even sooner these villages will be self-sustaining through their own renewable generation, providing residents with clean, reliable and affordable electricity. In addition, communities will be able to co-fund and economically benefit from shared renewable assets. We are all blockchain enthusiasts here, but can you give me one reason why blockchain will not reach mass market adoption, if any? Power Ledger fully believes blockchain solutions will reach mass market adoption. We are starting to see the industry come to the realization that the way we structure and regulate energy markets, and the frameworks that are put in place, need to change to support the disruption, not be at odds with it. At Power Ledger we fundamentally believe that blockchain is a technology that will be integral to the transition and compliment the required changes to the energy system. Scalability always comes into the conversation when discussing the challenges of applying blockchain beyond small proof of concepts and pilots as transaction requirements per second increases. We’ve designed our platform in such a way that we can support our immediate and projected future requirements in lieu of scalability improvements in the underlying blockchain technologies. Overall the energy sector is a great fit for blockchain, and in the complex, transactive nature of peer-to-peer trading, only the blockchain can support low-cost, fast and accurate reconciliation and settlement. What is the main limiting factor for blockchain and energy here in Asia? Not surprisingly, the main limiting factor affecting the uptake of blockchain technology in Asia is regulation. We have been fortunate enough to engage with regulators to find ways to allow the implementation of trials of our software. Providing a sandbox environment, like our project with BCPG in Thailand, has proven to be one of the most effective ways to test our solutions. Additionally, the risk associated with trialing new technologies, especially those associated with cryptocurrencies, can be another limiting factor. There is some apprehension around altering the current energy system with blockchain, and the potential effects it will have on the existing business models of energy retailers and network operators. We have found that open communication and collaboration with all stakeholders involved has been effective in mitigating this. The innovation and potential to revolutionize many industries in Asia is vast, particularly in the energy sector. Having said that, the energy industry is typically slow moving. It is being forced to change frameworks, structure and approach engrained over many years of the traditional centralized grid due to the proliferation of decentralized generation. This is a paradigm shift for the industry and the regulators that govern it, so there will naturally be a learning curve initially. What can energy companies in Asia learn from their European counterparts in terms of trialing blockchain technology? We have noticed that like Europe, many countries in Asia are warming up to blockchain technology as well. As evident with our partnership with BCPG, Thailand is certainly on the pathway to considering regulatory changes by allowing trials like ours to be implemented. Additionally, we are seeing that Malaysia is also actively considering the introduction of blockchain solutions. There is an element of curiosity in experimenting with blockchain technology to gain first-hand experience of the benefits of these innovations. We have found it very rewarding working with various agencies in Asia to fully understand their views and challenges they face in their local environment. Do you have any last comments or suggestions for attendees who want to learn more about this exciting new field? The best thing that anyone interested in learning about P2P energy trading can do is to read, listen and absorb content or articles online. There are a lot of resources that are very educational and helpful, but the energy world is constantly changing so it can be hard to keep up. Due to its infancy and nicheness, the space Power Ledger is in is ever-evolving, and even we are continuously learning from regulators, consumers, energy retailers and government agencies on how we can all work together toward a better energy future. Vinod has over 25 years of experience in operations, senior sales and business development roles within the renewable energy and other engineering industries. He has a successful track record of building and defending market share, expanding product lines, developing renewables portfolios and developing and executing long term strategies to achieve challenging sales targets and influencing key stakeholders at board and senior management levels. 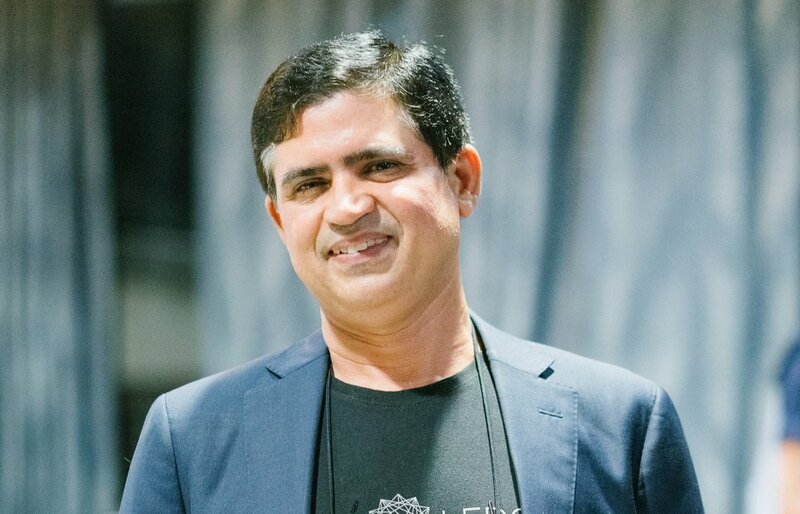 Vinod is leveraging his extensive network of contacts to engage Power Ledger's technology with client stakeholders across power and business domains, as well as third party providers to support the delivery of the company’s groundbreaking products. Most recently, Vinod was General Manager Sales at Perth Energy with a responsibility for all gas and electricity portfolios. In that role, Vinod successfully grew the energy sales for the company from a $20 million annual turnover to more than $300 million. Academically, Vinod holds a Bachelor of Engineering in Electrical and Electronics and a Master of Business Administration from the University of Western Australia. He has also completed the Executive Leadership Program at the University of California, Berkeley, USA. Vinod will take the stage during Blockchain2Energy Asia, the comprehensive 1-day event and networking platform fully focused on blockchain and energy applications, including insights in current initiatives and a realistic outlook for future projects. Learn more about the event’s program here.